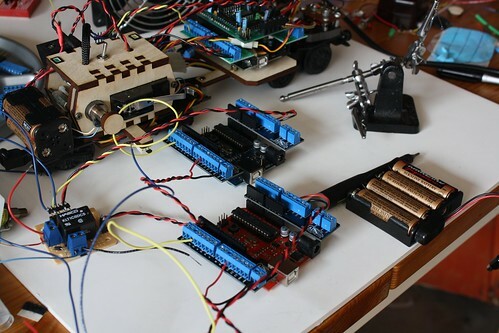 This project uses three Arduino boards and just as many sets of ScrewShields. It’s the Railographic Apparatus, or Rail-O-Graph, that Usman Muzaffar and I are creating to show at Maker Faire. The ScrewShields have been a lifesaver getting this put together, and staying together. This entry was posted on Tuesday, May 26th, 2009 at 4:48 am and is filed under ScrewShield. You can follow any responses to this entry through the RSS 2.0 feed. You can leave a response, or trackback from your own site. I see the wings in this picture have more screws than the stock kit provides — no empty holes.